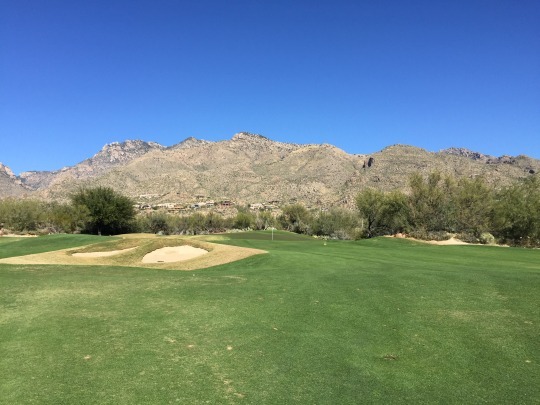 I had a 1:42 tee time booked for just $38, but was hoping to get out there earlier and I did. 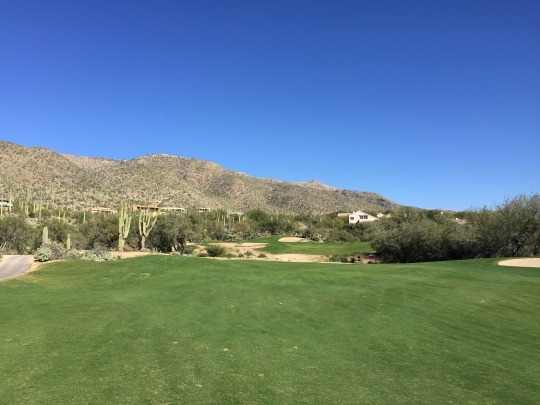 It was about a 40-minute drive across the valley to Arizona National because there’s no quick way to get out there from other parts of town. It was rather busy at the course on a beautiful afternoon and I’m sure they had their own frost delay to deal with in the morning. Still, I was able to work with the starter and get out ahead of my tee time. I was paired with another single and a twosome teeing off a little after 1:00. I’m sure glad it worked out that way because we were just finishing as it was starting to get somewhat dark. We were riding the group ahead of us all day and I’d guess only another group or two were able to finish behind us. 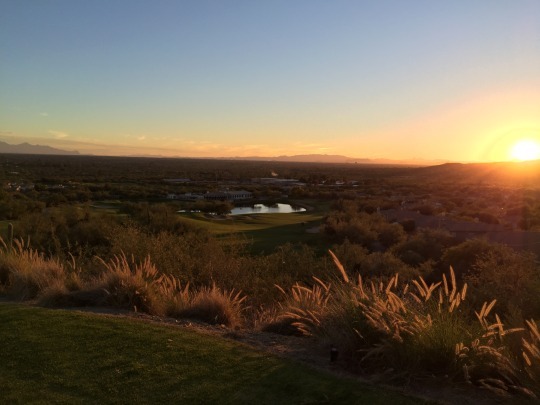 We were treated to another glorious sunset as we teed off on the 18th hole with an elevated view. 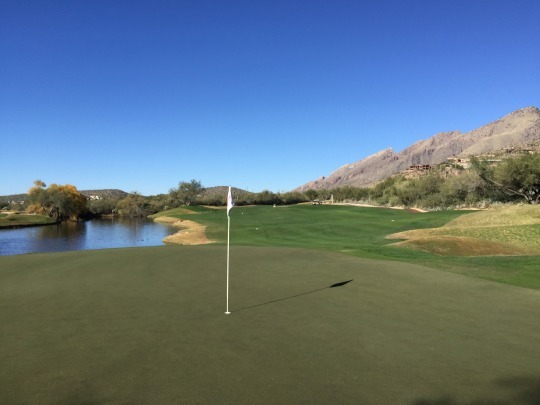 Arizona National is another Tucson course with some name change in its history. 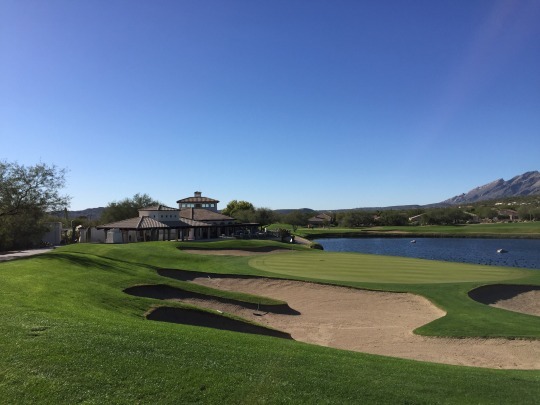 At one point, it was known as The Raven Golf Club at Sabino Springs. 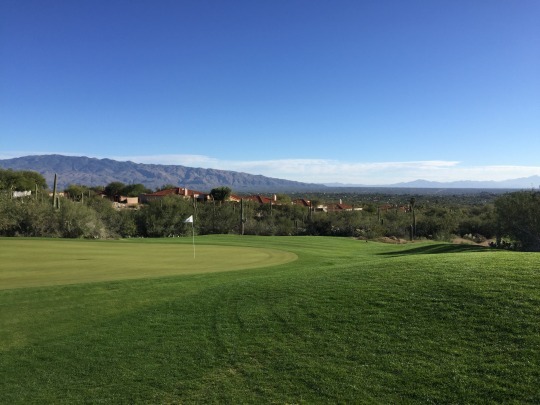 I don’t know exactly when it changed names, but they were the previous home course to the University of Arizona golf teams before Sewailo. All the staff is still proudly dressed in the traditional Wildcat colors and the logo is now kind of a bastardized version of the Arizona “A.” I know it was the actual “A” at one point, but I’m sure they had to change it once the team moved elsewhere. 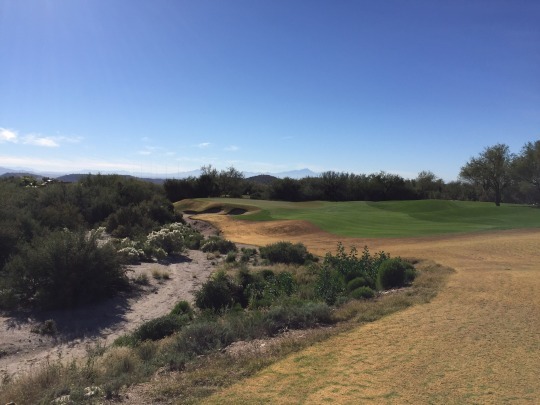 Either way, Arizona National is another great Tucson track that has a lot to like about it. 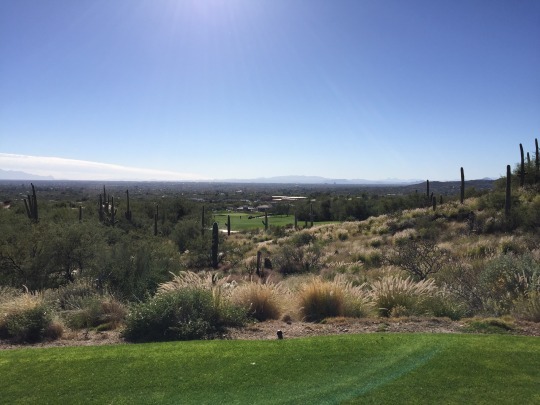 Based on some pictures I had seen and a similar foothills setting, I was expecting something similar to Dove Mountain. 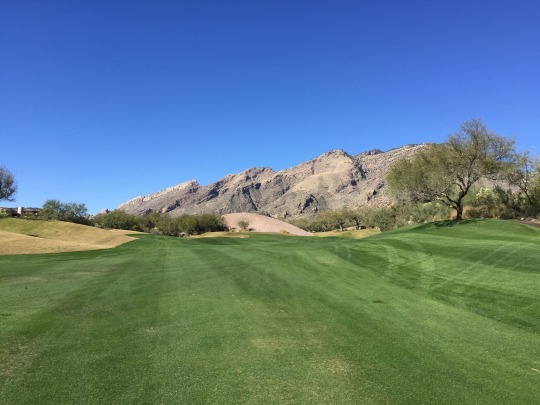 That really wasn’t the case as Arizona National has a “greener” overall feel with more trees and grown-out brush along the fairways rather than just desert and saguaros. There are still plenty of saguaros here, too. 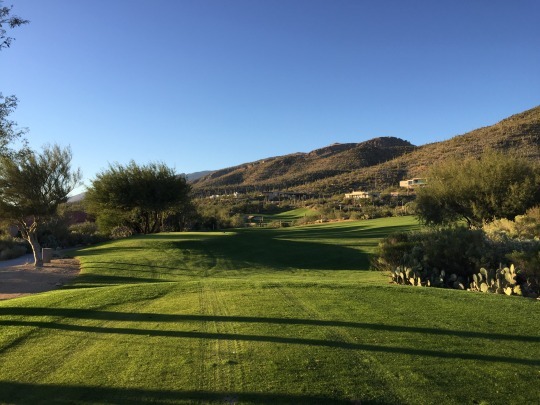 It is built on the side of a hill, though, and that terrain allows for some fun golf going up, down and along the rugged hillside. 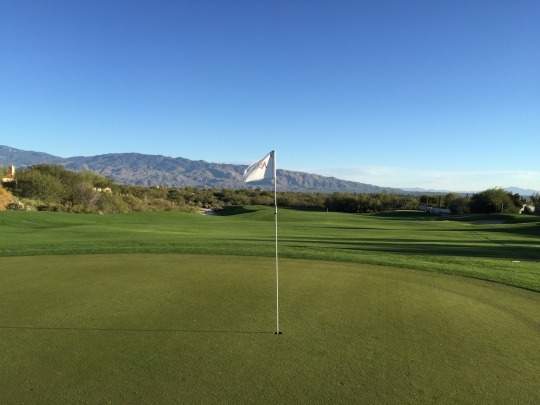 It’s not the most difficult course in town, and that seems to be one of the reasons the U of A left. 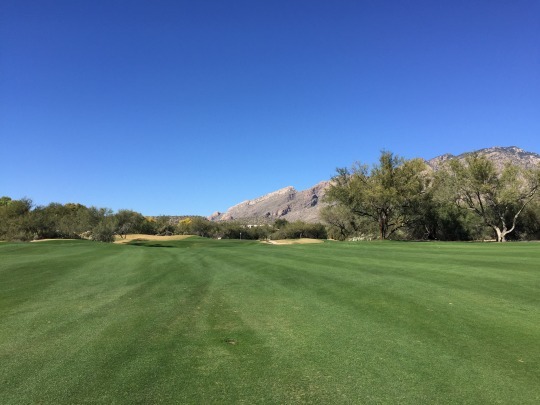 The fairways are generally forgiving and the greens aren’t overly complex compared to some others I played. There are some tricky “target” holes, but nothing too extreme. 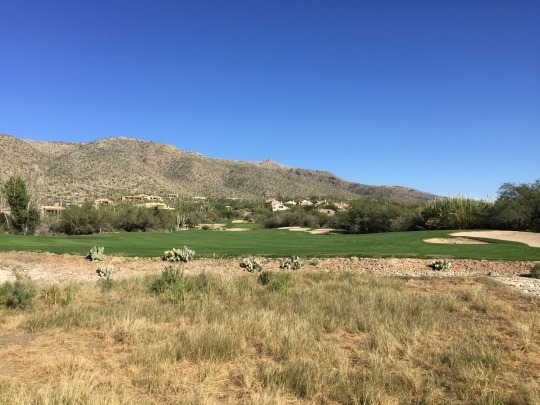 Overall, it’s a very pleasant desert design ideal for local golfers and out-of-town visitors, but probably not for college-level competition anymore. I still enjoyed it a heck of a lot, though. 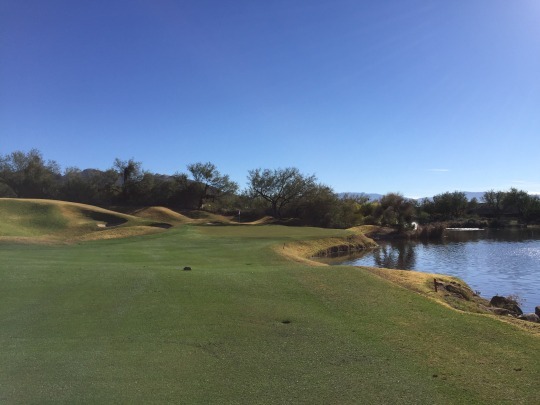 This is a solid course with a lot of diversity in the holes and a ton of beautiful scenery. I think it also had the best set of par-3 holes of any course I played on this trip. 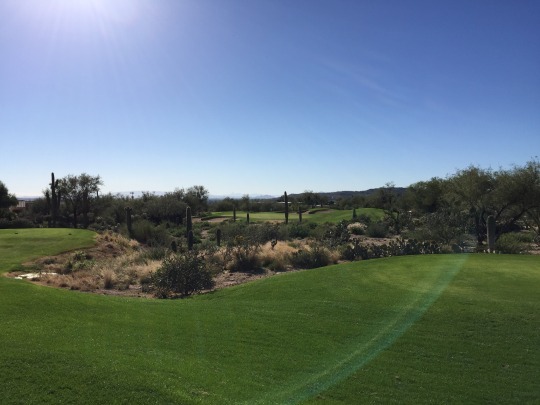 In general, I was actually disappointed in the par-3 selection at most courses I played. 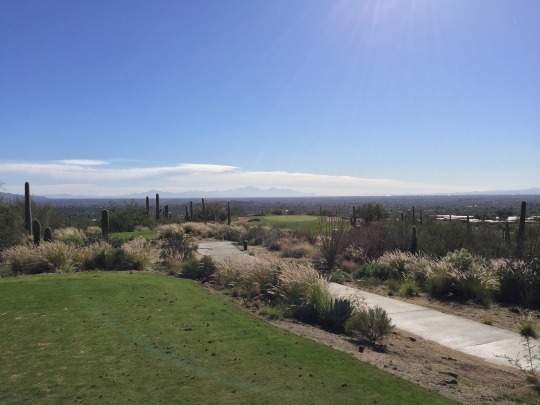 Given the dramatic desert terrain and the elevation changes of a few courses, I expected something with more “wow” factor. 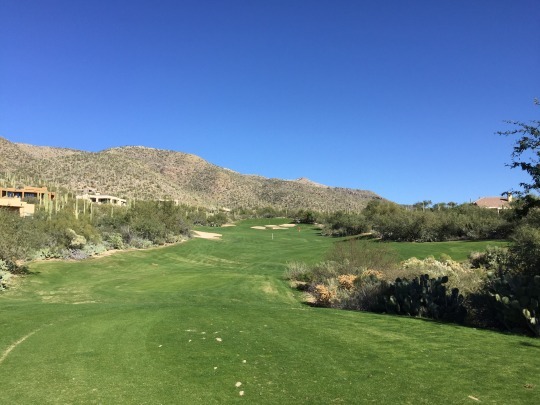 There were a couple really nice short holes at Starr Pass and one really spectacular one that you’ll see later, but otherwise I feel that Arizona National had the strongest full set. 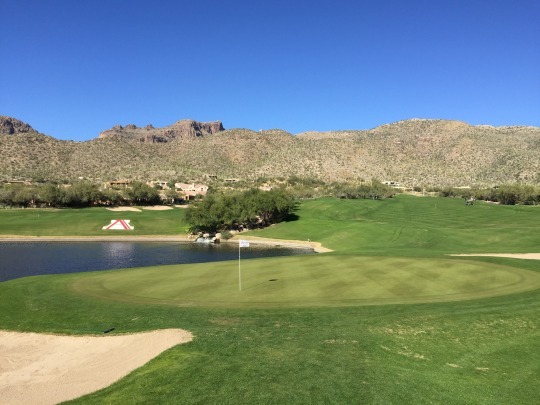 The 18th would be the other hole that stands out at Arizona National as the signature hole. 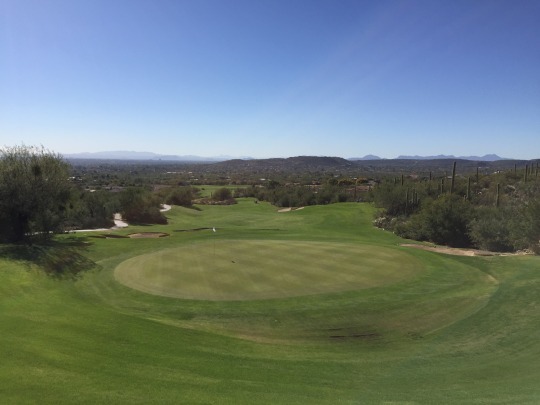 It features an elevated tee box and plays as a fairly short par-5 with that drop-off. 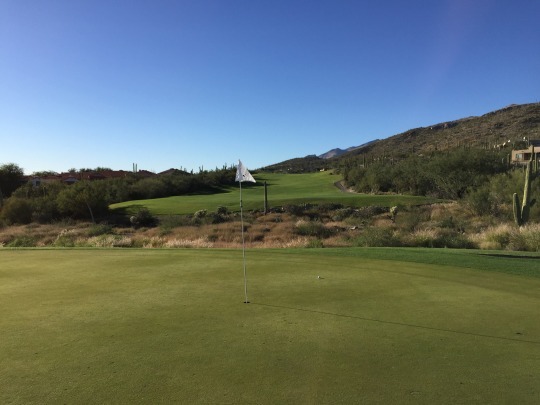 However, the green is very tucked back and to the left, protected by water and bunkers, so it makes any “go for it” second shot pretty intimidating. 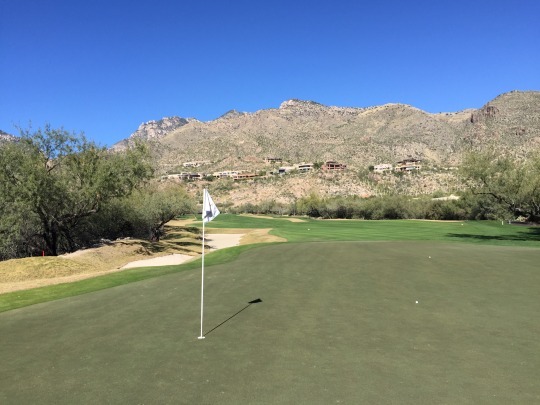 In fact, all the par-5s at Arizona National were also very interesting and nice in their own ways. The course was in very good shape. The tee boxes were great. The fairways were mostly great. The rough was lush and had good coverage throughout. The greens were firm-ish and rolling at medium speeds. They rolled smoother than they looked. I was not in a bunker, so no comments there. 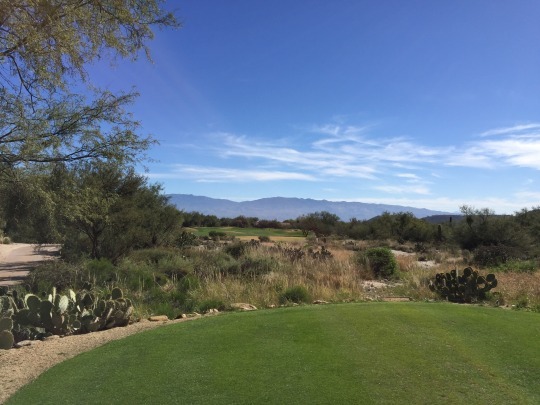 There are plenty of reasons why Arizona National is one of Tucson’s most popular courses. Good deals can be found there to make it more affordable than some of the other high-end tracks. 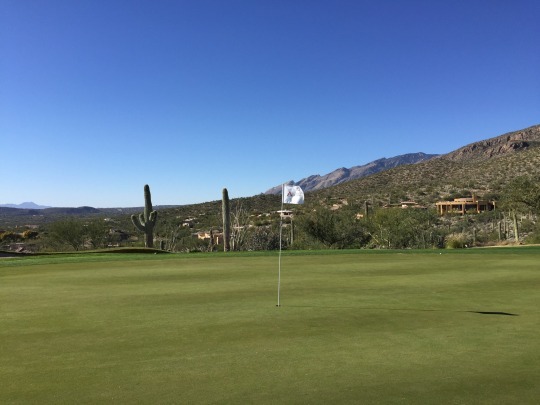 At the same time, you get a similar level of quality service, nice conditioning, beautiful scenery and a fun desert layout. You can’t ask for much more than that! I actually thought I had something else lined up for Saturday, but the connection fell through. 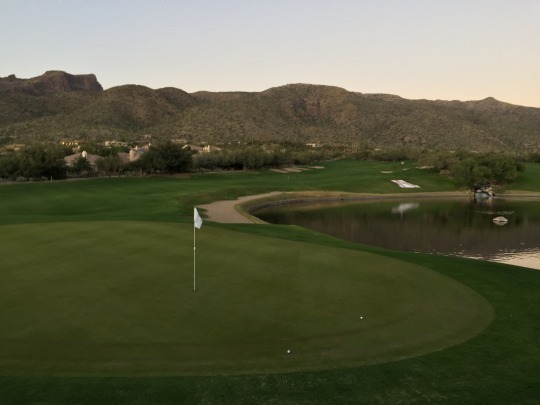 Ventana Canyon was a last-minute decision on Friday night. 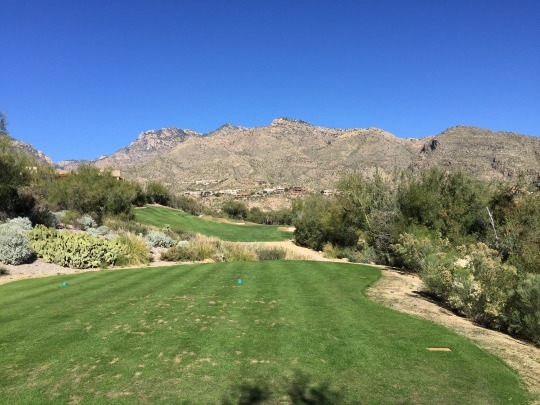 Don’t get me wrong because it was actually one of the top courses on my wish list for Tucson, but I just didn’t think I was going to play it on this trip. 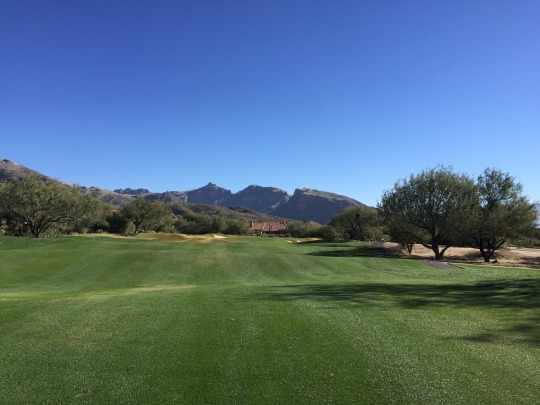 One of the deciding factors is that they had an early Saturday morning tee time available on the Mountain Course. Both courses here are supposed to be great, as one would generally expect from Tom Fazio designs. 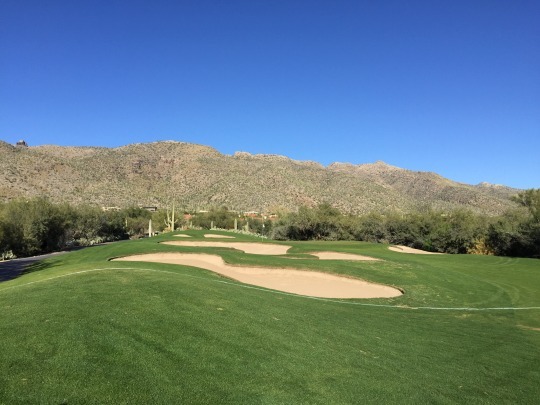 However, Mountain has the one super signature hole that I wanted to check out. 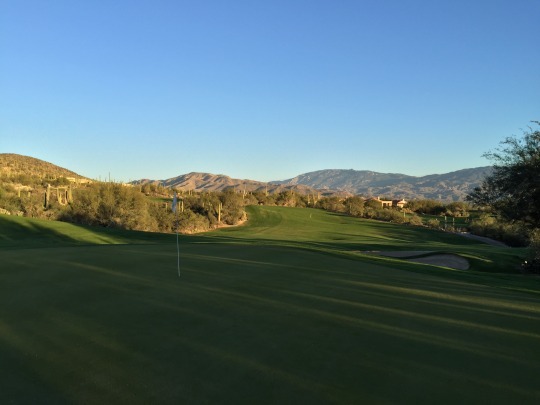 It is a semi-private club, so one course is reserved for member play only and the other is open to resort guests any given day. 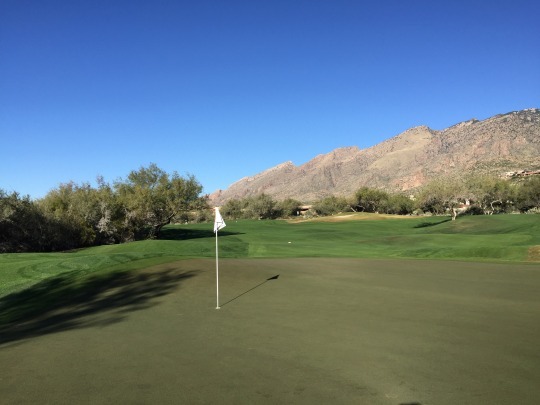 All week I was there, the Canyon Course was the one open to the public (generally listed at over $100). 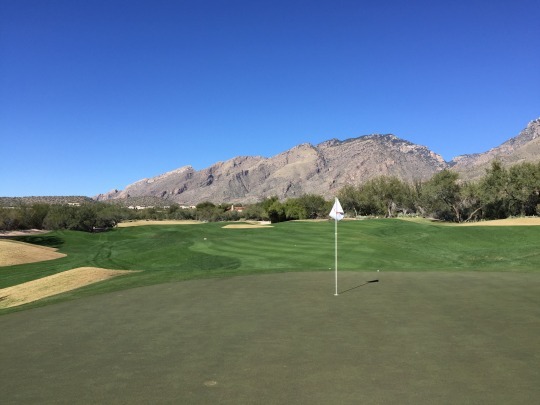 So when I saw a 7:40 tee time on Mountain available for Saturday at $99, it was a pretty easy decision to book it and splurge for my final round in Tucson. 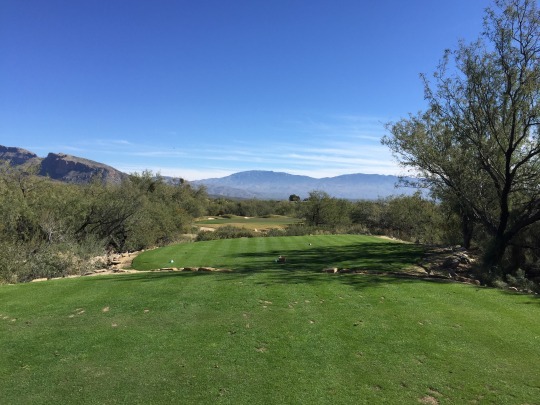 Ventana Canyon also has a couple names it may be known by. 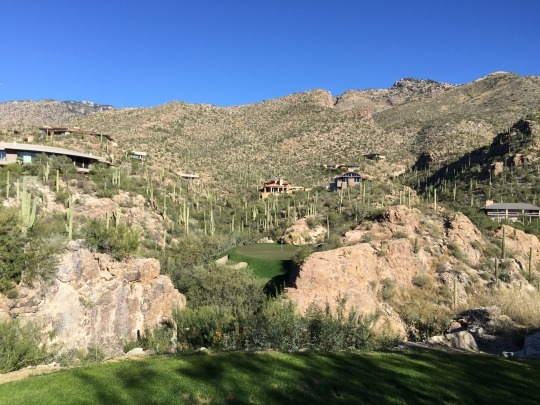 The old name is The Lodge at Ventana Canyon, but I think that is out the window. 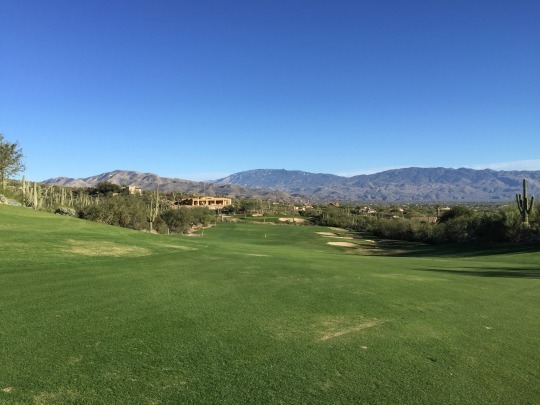 It is affiliated with the Loews Hotel, which is under some renovation right now and looks to be called Loews Ventana Canyon Resort. The member club name is what I used in the title, so I’ll stick with that for my reference. 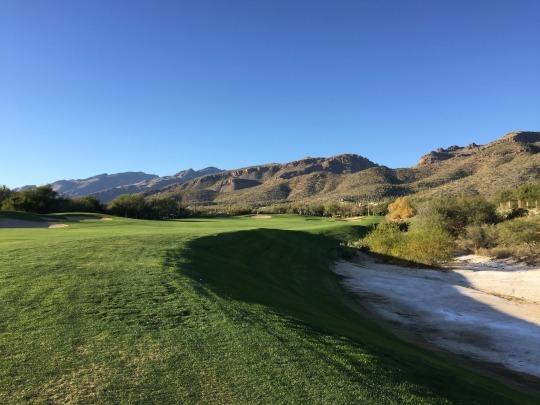 However, because of its semi-private nature and the fact there was an hour frost delay in the morning, it was a rather awkward experience getting started at Ventana Canyon. First, I go to the main Ventana Canyon club gate, but the guard says that guests need to park at the Loews Hotel up the road and check in up there. 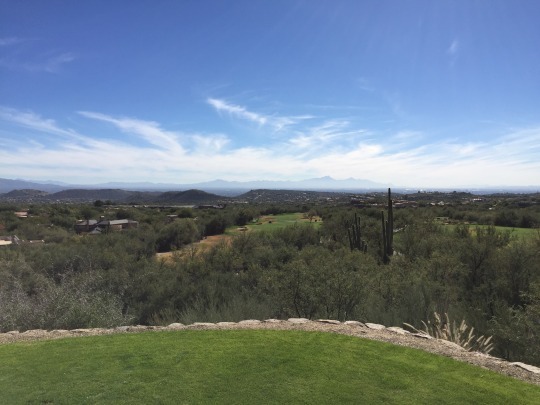 I head up there and there is really no signage pointing to where to park or check in for the golf course. Fortunately, I ran into a hotel worker who showed me where to go. In the back of the spa/restaurant building, there’s a tiny pro shop hidden away. I go in there and the guy lets me know about the frost delay. I thought he checked me in because he had all my info from GolfNow. He tells me I’ll be in the third group out at 8:50. I didn’t feel particularly welcomed and didn’t really know where to go or what to do while waiting. I hovered around the cart prep area for a little bit, but nobody said anything. So then I walked back up to the hotel to wander around inside the warm building. I found a gift shop and bought some snacks that would have to do as breakfast. Eventually, I work my way over to the cart prep area again and finally one of the attendants mentioned that the driving range should open around 8:00 and I could head over there if I wanted. 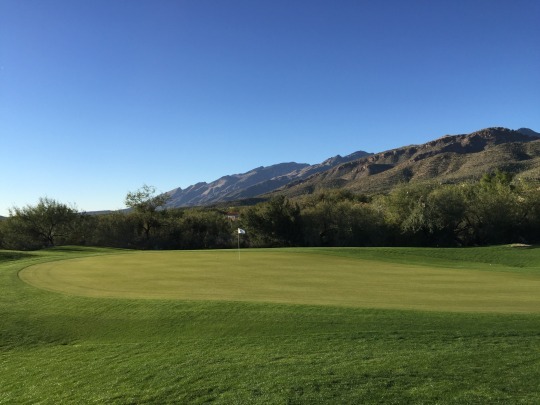 It is a lengthy drive over to the driving range area, where the starter for the Canyon Course is and there were a lot of members milling around. They also had a snack shack over there that I wish I was aware of earlier because I would have gotten real food while waiting around instead of what I settled for in the hotel gift shop. 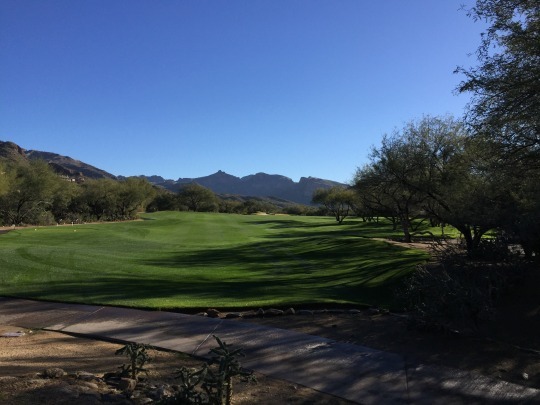 I knew where the Canyon starter was, but still had no idea where the Mountain starter was, so around 8:30, I drove around the maze of cart paths intertwining holes from both courses and eventually found the first hole of Mountain. The starter had me on his list and said “all was good,” so he sent me over to a putting green nearby and said he’d come grab me when my group was ready. By the time 8:50 rolls around, he comes back and says I need to check back in at the pro shop because they never officially checked me in or technically collected the remainder of my payment—even though I was hanging around for over an hour with nothing else to do! So, now my group is on the tee and he sends me to a different pro shop (the much bigger and nicer one for members) to check in again and pay my balance. By the time I get back to the first tee, I am feeling rushed and three members are standing there waiting for me to hit. At first, they seemed annoyed I was paired with them, but they ultimately turned out to be really nice guys that I had a lot of fun playing with. 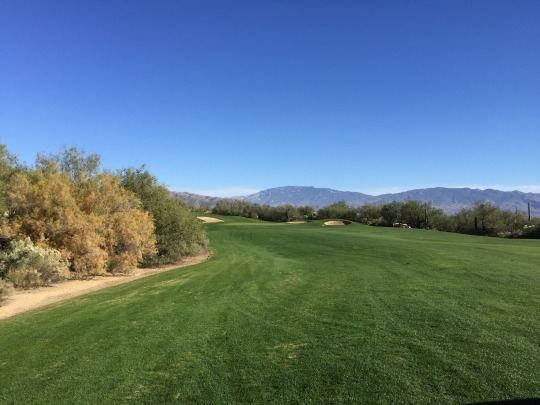 Getting started was a confusing and unpleasant experience and I felt like a second-class citizen as a non-member, but once out on the course, everything was great. There were no worries after that. The group ahead was a bit slow at times, but we still finished in about four hours, 20 minutes. 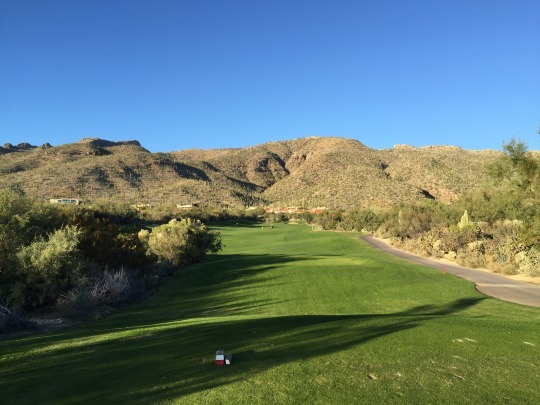 Ventana Canyon has some similar qualities to Arizona National (which is somewhat nearby) with more trees in play. 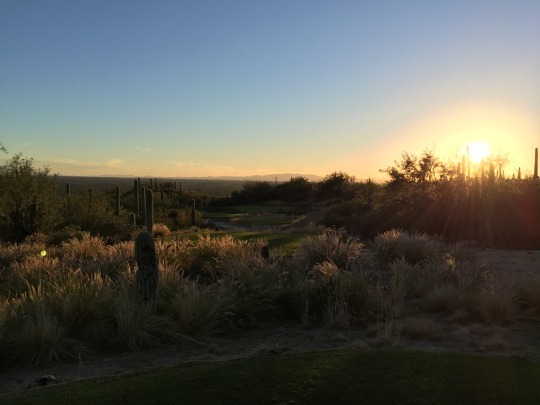 It’s a more lush desert look than rugged. 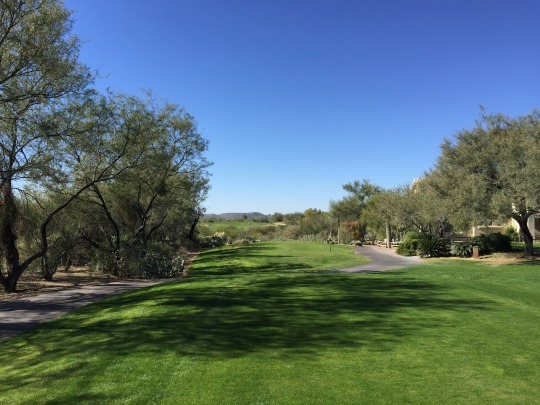 It also has pretty wide and forgiving fairways, but where it gets tough is on and around the greens. 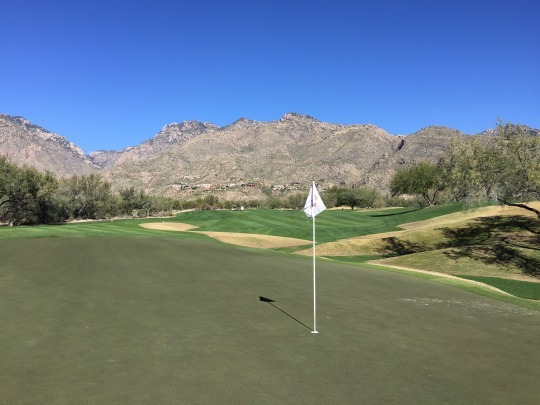 Most greens are protected by big mounds, false fronts, deep bunkers and steep shelves that make it hard to get the ball on the putting surface at times. Then, the greens themselves are very large and feature plenty of undulation. Adding to the challenge was the fact that they were firm and lightning fast. They were by far the nicest greens I played on all week, but took some getting used to because they rolled so much truer and quicker. 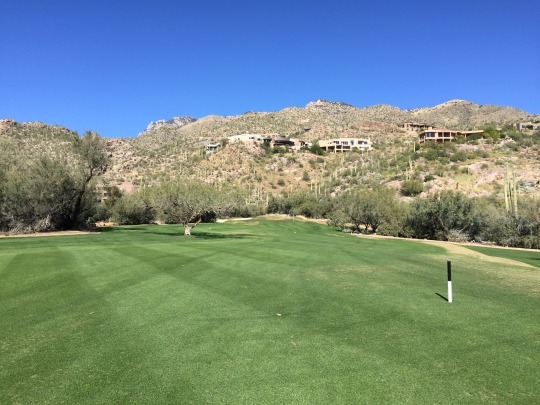 Another interesting feature of Ventana Canyon is the presence of some burms and ledges that run along or sometimes show up right in the middle of fairways. 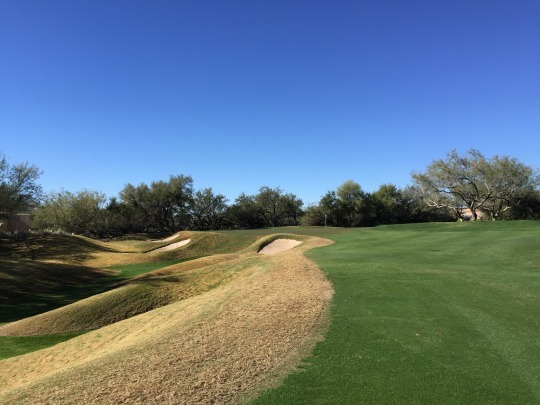 The main rough here was overseed with green rye grass, but these extra features are left dormant bermuda. They provide some visual intimidation, but really aren’t troublesome at all right now because it’s easy to hit the ball from. I imagine during other parts of the year, those can be troublesome if the rough is deeper and more lush bermuda grass. 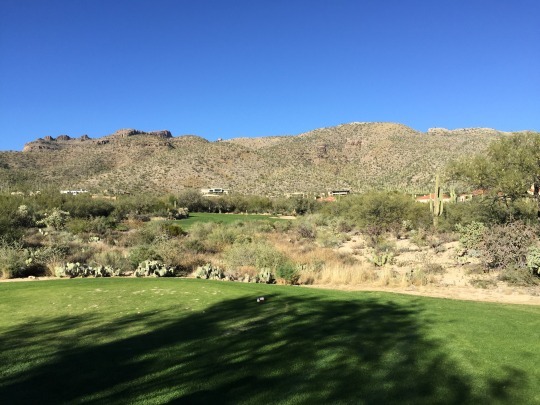 Most of the course runs down in the valley and there aren’t any extreme changes in elevation other than the back tees of the 18th hole. Again, I would describe it as “pleasant” to the eye and fairly forgiving until you get anywhere near those very difficult greens. 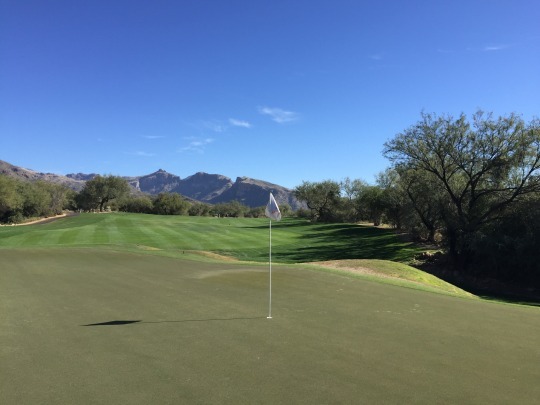 Then, you have the one signature hole that certainly sticks out because it is unlike anything else on the course and it is one of the coolest holes you will ever play. The par-3 3rd is an absolute gem. At the time it was built, it was supposedly the most expensive hole ever designed and I can see why. It is literally carved out of the rocks on the hillside and feels like something out of Disneyland. 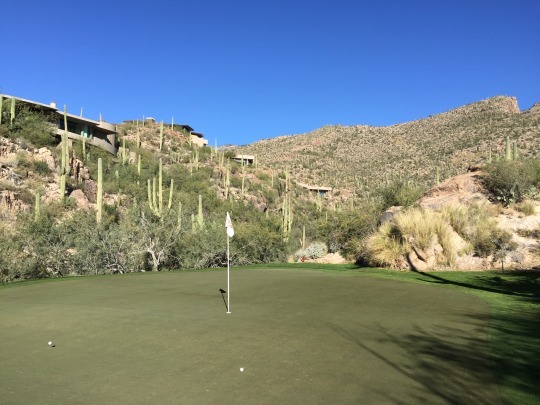 It is just a short par-3, topping out at 107 from the tips. 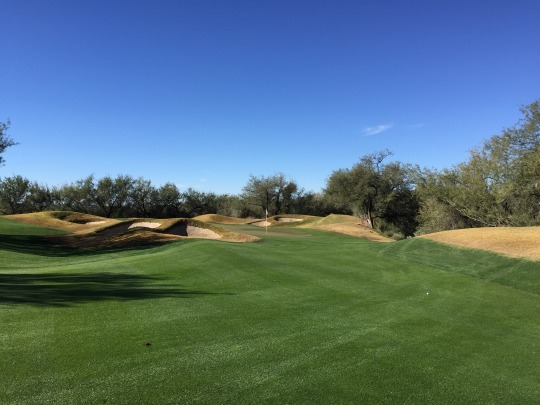 It offers a few different tee boxes and angles. The tee boxes themselves are extremely neat as they are perched atop some rocky outcroppings and must have been difficult to chisel out. 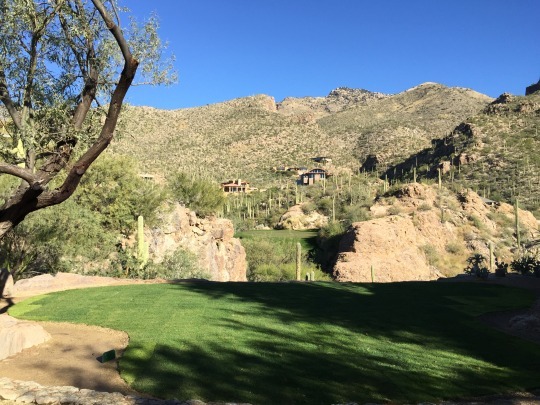 Then the green itself is kind of an island amidst another desert rock outcropping across a small ravine. The hole itself feels completely separated from the rest of the course and it’s just kind of its own thing by itself, which is interesting. This hole is the biggest reason to play this course. 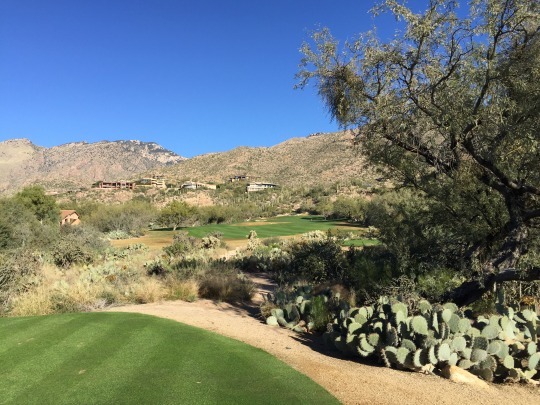 Basically, there are 17 very nice golf holes here and then one truly spectacular hole. However, what kind of works against it is the fact that it’s only the 3rd hole. It’s weird to have such a dramatic signature hole that early in the routing, but that’s where it sits. Based on where the 10th hole starts right next to the driving range, I would guess that the nines were switched at some point and I am not sure why. As it is, there’s no build-up to the signature hole and then it’s over really quickly. The whole rest of the round, I was hoping to see another hole or two with some similar rocky elements. Unfortunately, they never show up. 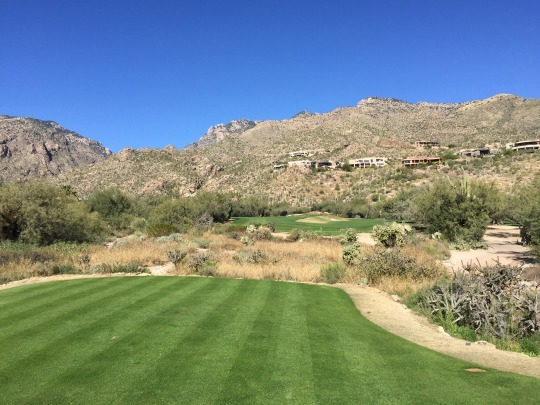 And though the rest of the course is very nice on all levels, the “wow” factor of this 3rd hole pretty much steals the show and lessens everything else afterward. I think if the nines were switched and it was the 12th hole, it would still stick out dramatically, but it would perhaps flow better with more build-up before and less build-down (for lack of a better term) afterward. I will say the course was in very good condition. The tee boxes were nice. The fairways were good with just some scattered thin spots here and there that rarely came into play. The rough was nice as I noted earlier. I have some legitimate complaints about my customer service experience, but my issue with the placement of the 3rd hole is really a very minor gripe. I just wanted to make note of it. In the end, I’ll never complain about getting to play one of the coolest short holes on the planet—one that belongs in the pantheon of great signature par-3s! By the time I left, the staff seemed more organized and people knew where to go. I don’t think the frost delay helped with the confusion, but they could have done more to direct me around when I arrived. Just know that if you book a time through GolfNow, be sure and head straight to the Loews parking lot and not the main gate. 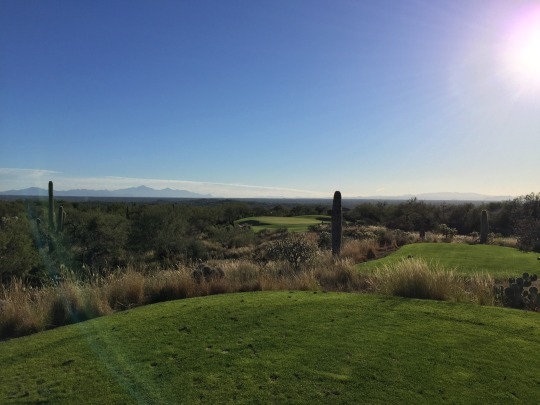 Once you are on the course, you’ll enjoy it, especially if you are able to savor your brief time on the spectacular 3rd hole.